Jakarta Governor, Anies Baswedan welcomed the 38th Indonesia International Book Fair (IIBF) delegations at City Hall, Jakarta.
" 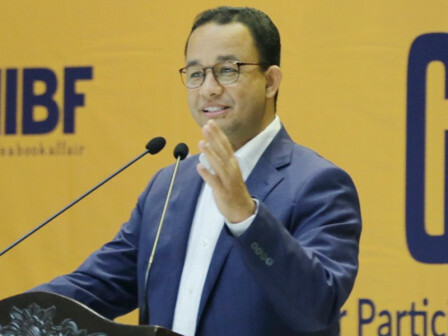 People interest in reading should grow and becomes a culture"
He expects IIBF event to grow resident's interest in reading, especially for Jakarta residents. "I want residents to be able to read and have passion to read. People interest in reading should grow and becomes a culture," he stated, Thursday (9/13) night. He explained, Jakarta Government has provided stationary and mobile libraries to facilitate residents to read. "Jakarta has enough infrastructures that support reading activities. So there is no reason for not getting access to read," he mentioned. He hopes, collaboration between City and Indonesian Publisher Association (Ikapi) can increase people interest in reading and number of books read. "After IIBF event, I want a follow-up meeting with Ikapi to plan for activities in order to increase public interest in reading," he explained. For information, the 38th IIBF is held from September 12-16, 2018 in Jakarta Convention Center (JCC), Senayan, Central Jakarta. This exhibition shows various book collections and attended by participants from 17 countries.